Affectionately referred to as our national pastime, baseball has been a cornerstone of American identity since the creation of semipro and professional clubs in the middle of the nineteenth century. The sport, at its purest and most simplistic form, ignores cultural and generational differences and unifies fans via competition. This article explores the role of baseball as it relates to national healing following the attacks of 9/11. 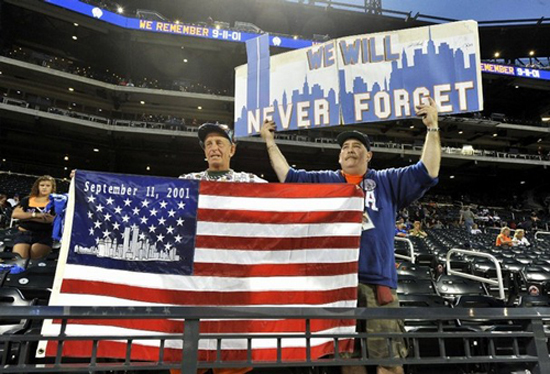 The article examines how baseball became an outlet for social mourning and specifically looks at how the sport fostered American patriotism post 9/11. This article also examines the overall role of baseball and sports journalism as an influencer of American thought in times of national crisis. For clarity, the term “baseball” within this article is non-specific and is a general reference to the sport. The notion that baseball can act as a morale booster in times of national crisis dates back to the start of the Second World War. Embroiled in global conflict with more than 500 major league players enlisting in the armed forces, commissioner Kenesaw Mountain Landis questioned the importance of the sport and sought the advice of President Franklin D. Roosevelt in moving forward with the 1942 season. Roosevelt’s full response to Landis, known as the “green-light letter,” is arguably the most pivotal presidential declaration in the history of sports. “Baseball provides a recreation which does not last over two hours or two hours and a half, and which can be got for very little cost,” noted Roosevelt. The Sporting News, following Roosevelt’s response, conducted dozens of interviews with service members to gauge their opinion on baseball’s purpose during the War. The majority sided with Roosevelt’s suggestion that the ’42 season go on as planned. “For the morale of the solider and the morale of America itself, ‘keep ‘em playing’,” said Private Clifford P. Mansfield of Fort Knox, Kentucky. For many Americans, life came to a standstill immediately following the attacks of 9/11. Shock and sadness settled in, followed by anger and resentment. News coverage of the attacks and the aftermath saturated the media landscape. Major League Baseball, along with several other professional sports leagues, halted its schedule and questioned its ultimate triviality. Commissioner Bud Selig debated baseball’s appropriate date of return and consulted with political officials, including President George W. Bush. He wondered how baseball, a simplistic sport meant primarily for leisure and entertainment, could counteract the sadness and fear of millions of Americans. The Major League Baseball schedule resumed on Sept. 17 and the game itself was secondary, rightfully trumped by acts of remembrance and patriotism. The six ballparks that hosted contests across the country that night provided a much needed place for people to assemble and mourn. According to the social and organic solidarity theories of renowned sociologist Emile Durkheim, the assemblies played a cathartic role in the healing process because oneness (unity) trumped individuality. Patriotism was at a generational high immediately following the attacks. People put political affiliations aside and instead felt an urgency to rally together to demonstrate nationalism and support. This sense of commonality and oneness provided an outlet for healing. Randall Collins, another well-recognized sociology scholar, expanded on Durkheim’s theory claiming that when outsiders come together sharing a common mood or emotional experience they can inherit a positive emotional energy. According to Collins, conflict such as 9/11 produces group solidarity in four phases: (1) an initial few days of shock; (2) one to two weeks of establishing displays of solidarity; (3) two to three months of high solidarity plateau; and (4) gradual decline toward normalcy in six to nine months. For purposes of this article, let us look at Collins’ first three points and their relation to baseball post 9/11. Point 1 (Shock): Baseball games were cancelled for six days from Sept. 11 until Sept. 16. Players openly debated the triviality of the sport in light of the attacks. Every sports writer has heard it before – the sports department is the ‘toy department’ of the newspaper. True, stories pertaining to murder, fire, and war rarely run in the sports section of a newspaper, but that does not discount the societal impact a solid sports story can have on a community and nation. Sports journalists have slightly more wiggle room compared to other reporters because sports are a form of entertainment. “In the aftermath of trauma, the familiarity of sports reporting helps index that which has not changed,” contends Serazio. As a sports writer it is important to investigate to find the story within a story. The sports pages following 9/11 were full of stories dealing with baseball’s return, but went deeper and looked at what the return of the sport meant to the psyche of America. Baseball simply was the decoy as journalists provided patriotic and strength inspiring stories with the sport as the backdrop. Baseball gave the nation comfort in a time of despair and provided an emotional outlet where people could mourn and turn their thoughts away from the grim happenings of reality. The sport represented American normalcy and demonstrated our willingness to move forward while still remembering. The comments from Landis, Roosevelt and the service men about the role of baseball during World War II held true through 9/11. The sport is a way of American life and things would be different without it. For so many reasons, baseball is more than a simple game played on a diamond. "When I look back on those days once play had resumed, it gives me pride that the national pastime provided fans with some moments of normalcy and joy,” Selig said last year. "In baseball's function as a social institution we wanted to be not only sensitive, but we wanted to play our little part in the recovery process. It was a painful time, an emotional time, but we did fulfill that role."